Ontario Premier, Doug Ford. Bottom right, with brother the late Rob Ford. Just when it seemed safe to venture back into the chilly waters of municipal politics, without having to think about the size of council, along comes a shark in the form of premier Doug Ford and his plan to shrink Toronto City Council, effective this fall. Appropriately, he announced it during Shark Week. Many Torontonians are outraged. Savings won’t budge the Richter scale. Opponents of Ford say a plebiscite is the only rational way to change the size of City Council. Opponents are suspicious of the motives of Premier Ford. He claims the proposed cuts will save $25 million over four years, but Toronto has an annual operating budget of over $11 billion. This means the projected savings barely register on the Richter scale. Opponents also worry of effective representation. As proposed, a cut from 47 councillors to 25, serving a population of three million, means that there will be about 120,000 constituents per councillor as opposed to about 66,000, today. A councillor representing 120,000 people could easily be occupied full time dealing with ‘fix it now’ issue like potholes, garbage collection, backed up sewers or snow removal and have no time left for attending meetings or making policy. Mind you, it’s no doubt difficult to balance those tasks when you already represent 66,000 people, but doubling the volume inevitably adds to the burden. 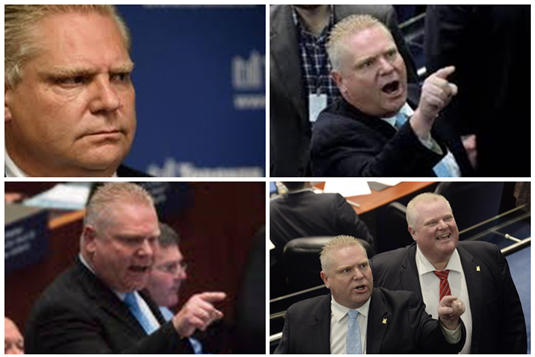 Conspiracy theorists argue Ford is plotting to consolidate power. Leave the policy making to the big dogs at Queen’s Park, while those twenty-five hapless souls on Toronto council have their hands full with day-to-day issues. I know next to nothing of that Toronto. I know next to nothing of Wellington County, but feel freer to opine regarding it, as I am a resident. Since last November, we, in the County, have lived with an Ontario Municipal Board decision that upholds a rejigging of ward boundaries, by the County, as well as the number of seats at the Council table. We will have a mayor and 13 councillors for this election; previously, we had a mayor and 16 councillors. Toronto is not the only target. Are Ford and his crew next going to tinker with the size of Wellington County Council? Their announcement also imposes new electoral structures on York, Peel, Niagara and Muskoka. Maybe the Municipal Board just hasn’t gotten around to us yet. Targeting the County is not unprecedented, as we have just seen in the very recent passage of the White Pines Wind Project Termination Act. Is Wellington County vulnerable? Will Premier Ford follow through? Will he make cuts to our council in the same proportions he is making in Toronto and reduce us to seven councillors? Will he look at councillor to population ratios? if the ‘one councillor per 120,000 constituents’ rule is good enough for Toronto, will that mean that with just 25,000 people to take care of, we are at risk of being cut back to one councillor for the whole County? It’s very different from the ‘one councillor for every 2,500 residents’ figure that was touted at the time of County amalgamation, but hey, times change. Indeed, compared to Toronto, our ratios are so low that you could argue we should just have a mayor and forget about councillors completely. That would obviate the need for a council chamber and silly taxpayer funded agendas, reports, meetings, motions, minutes and sandwich lunches. It would require our mayor to spend much more time out and about responding to complaints, which would get him off his duff and be good for his health. So maybe her office could close and she could make do with compensation for mileage on her truck and a good cellphone plan, along with a per diem for meals and a Ti card for coffee breaks. Putting the mayor, alone, in charge would certainly speed up decision making for the County. If Ford didn’t like decisions made by the mayor, he could always legislate them away. The County is a model of efficacy. Premier Ford may well have a valid point. Forty-seven councillors in Toronto may be a recipe for inefficient decision-making. If he thinks taking Toronto down to 25 councillors will be the solution, he should visit the County to marvel at the brisk efficiency and laser-like focus of our current crew of sixteen councillors, all of whom enable this by preparing thoroughly for meetings, having pored over their agendas and background documents. In other words, each one is doing his or her job. For the next meeting, of Wellington County Council, my advice to Ford is to bring along a good book, perhaps one about sharks or, alternatively, a sedative.